One of the most famous views in Acadia is from the south side of Jordan Pond looking north at the Bubbles across the lake. Both of these beautiful little peaks (South Bubble and North Bubble) have trails that go to the summits that make for great day hikes. In addition to being a wonderful viewpoint, South Bubble also has a famous tourist attraction: Bubble Rock (aka. Balanced Rock), a large boulder that was carried by glaciers and deposited at the seemingly precarious edge of a cliff. The hike from the Bubbles parking lot to Bubble Rock is a short family-friendly adventure, but keep an eye on children near exposed sections of the mountain. Rating: Short family-friendly day hike (to Bubble Rock). Some moderately-strenuous scrambling if continuing down South Bubble Trail. Elevation Change: 250 feet up to South Bubble, 400 feet down to Jordan Pond. 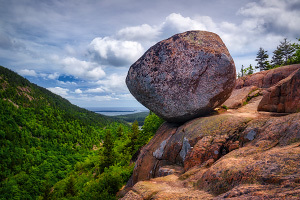 The easiest way to see South Bubble and Bubble Rock is to park at the Bubbles Parking Lot, a relatively small roadside parking lot located along the Park Loop Road roughly 2.3 miles south of the turnoff for the Cadillac Mountain Summit Road. (The lot may often be full by mid-morning in the tourist months.) Find the "Bubbles Divide" Trailhead and hike west up the well-maintained trail as it slowly ascends through the forested landscape. As the trail heads up the valley between North Bubble and South Bubble, you will pass the North Bubble spur trail on the right (north) and soon after, you will reach the South Bubble spur trail on the left (south). Follow the South Bubble Trail as it continues its ascent and soon enough, you will be standing on the summit of South Bubble. Continue hiking a few more minutes and you will see the short side trail to the legendary Bubble Rock. The area around Bubble Rock is a great place to take photos and explore, but please take care especially with children as the cliffs are quite steep and a fall could be fatal. And since this mountain sees a lot of tourists, please obey any roped off areas or "do not hike here" signs as they are designed to protect the vegetation. Continue along the South Bubble Trail for some great views looking south at Jordan Pond; there are many idyllic spots to relax and have lunch while taking in the vista. Those looking to take it easy should turn around before the trail starts its big descent. If you're looking for something a bit spicier, continue down the South Bubble Trail as it works its way down the cliffs towards Jordan Pond. (This section may not be suitable for those with young children.) This section of trail is somehwat exposed and has a few minor scrambling sections that could be intimidating, but it relents quickly enough. Once at the base of the cliffs, the trail works its way through the forested boulder field to join up with the Jordan Pond Trail at the water's edge. (While the water may be extremely inviting, no swimming or wading is allowed as this pond is a public water source.) 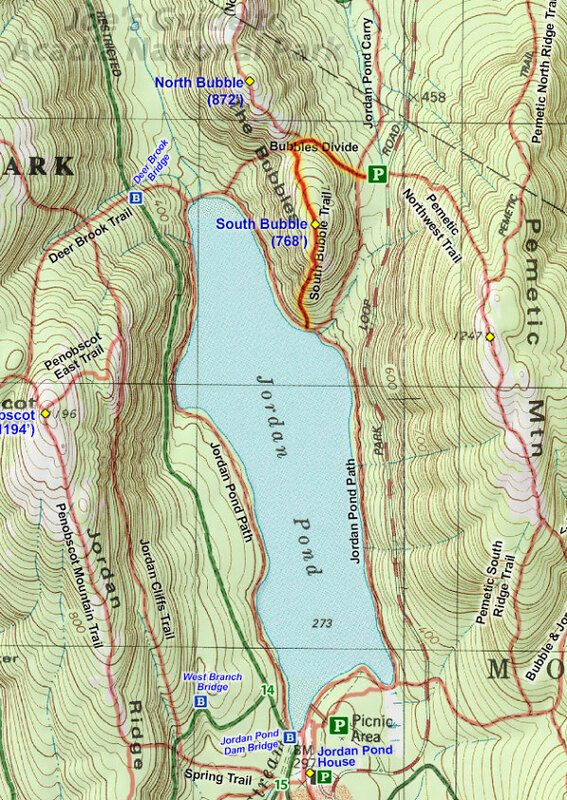 From this point, you can either turn left and hike east to take the Jordon Pond Carry Trail back to the Bubbles parking lot, or the slightly longer (and arguably more scenic) option is to turn right and hike west along a longer stretch of Jordon Pond to take the Bubbles Divide Trail back. For a longer option, a hike up the South Bubble Trail can be incorporated into a loop hike around the Jordan Pond Path. This hike could take roughly 2-4 hours. A quick side trip up to the summit of North Bubble (and back) is a great option as well and offers arguably better views of Jordan Pond. This could take an extra 40-60 minutes and is well worth the effort. Climbing is very popular on the southeast face of the South Bubble. (There is a climbing register off of the Jordan Pond Carry Trail.) Please do not throw any rocks off of any summit. 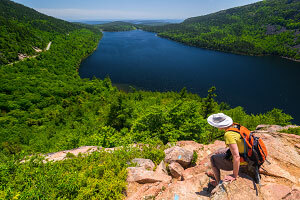 If this is your first visit to Acadia National Park, the easy hike up to South Bubble and Bubble Rock are a must! For those wanting to spice things up, descending South Bubble Trail to Jordan Pond and also hiking up to the summit of North Bubble are two excellent options.